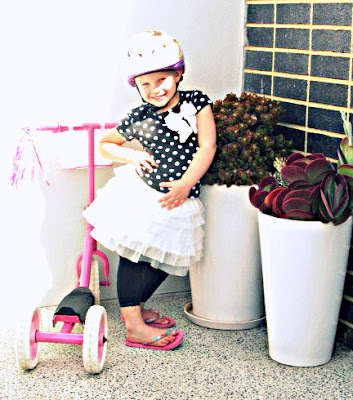 My daughter spotted a cute little scooter in a recent catalogue and explained to me and hubby that she just had to have it. 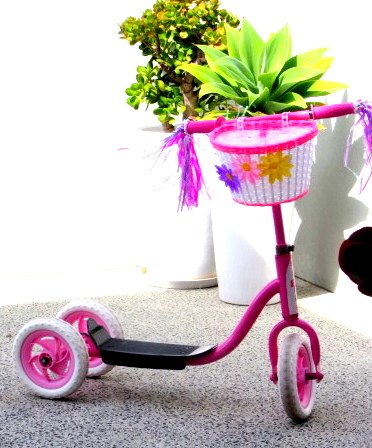 Rather than buy the brand new scooter my hubby picked up some great handle bar streamers, a pretty little basket and some pink paint from our local bike shop - to pimp up our little girl's plain and dull scooter. After about one hour of work in his shed our daughter had a very cute new ride. So pink and pretty for a fraction of the price. Well done hubby! I just love this image which a snapped yesterday as we were heading home from the park after a morning of riding a very pink and pretty scooter. Now I better stop procrastinating and start getting all our easter treats ready for our easter egg hunt tomorrow. Happy Easter!